I’ve been a little more than under the weather this week. When I’m sick, neuropathologist all I want is comfort food. Chicken soup and pasta and things my mom used to make when I was growing up. 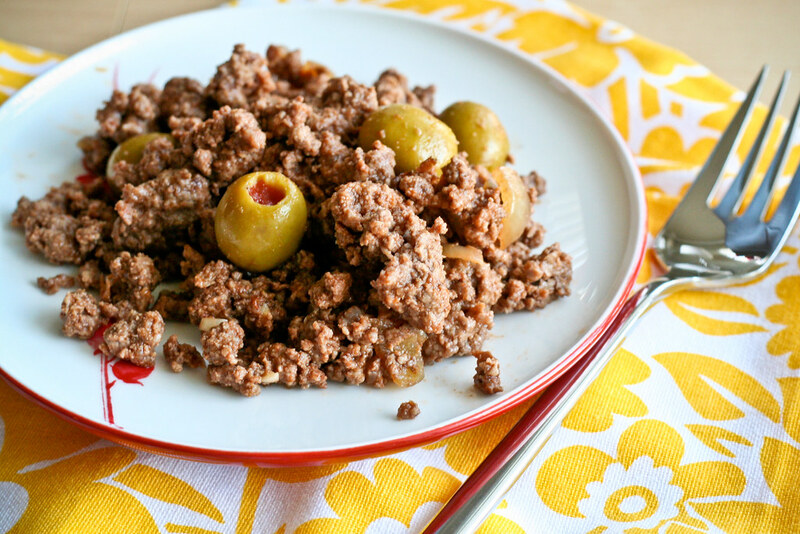 Picadillo is a really simple Cuban dish that’s basically cumin-spiked ground beef with onions, garlic, tomato and pimento-stuffed olives. Some people also add raisins, but I am not down with that. At all. This isn’t fancy food or weekend food, but it’s perfect for weekday dinners or quick lunches. It’s simple, delicious and versatile. Like everything else with Cuban food, Picadillo is most often served with white rice and black beans. Since I’m not a big rice person (and I can never make it as good as my mom does), I put mine on top of creamy polenta. It also makes a great taco stuffing or baked potato topping. Picadillo also makes a pretty good, Cuban-style sloppy joe. If you’ve never had Picadillo, give it a try. You might just find that it becomes one of your go-to weeknight dishes. Either way, it made me feel a little better this week. Heat the olive oil in a large skillet over medium-high heat. Once it’s hot, saute the onions for about 5 minutes or until soft. Stir in the garlic and cook for another minute, then add the beef and reduce to medium heat. Brown the beef, using a wooden spoon to break up any large pieces, about 10 minutes. Add the tomato paste, cumin and salt and stir until combined. If your pan is dry, add 2 tbsp. of water to help the tomato paste dissolve. Let simmer for another 5 minutes or so, then stir in the olives. Thanks for posting this recipe. My Mother, who was from Brooklyn, learned how to make Picadillo from one of my Cuban Tia’s. She made it better than any Cuban I know and I remember waking up to the smell which permeated the house when she cooked it late at night to be devoured the next day. Thanks for posting this recipe as I never learned how to make it before she passed away. The smell, alone, always brings back fond memories of my childhood and dinnertime and, of course, my mother! Similar to how I make it, but I heat the oil with annatto seeds for about 5 minutes to color and flavor the oil (strain out the seeds, return oil to pan). I also add in some cayenne pepper alongside the cumin to give it a little more heat. Raisins are a must for me. I slice my olives prior to adding them in, as I prefer their flavor to be spread more subtly throughout the dish. On occasion, I will add in a handful of diced and seasoned new potatoes, just to change the texture up a bit (but that is by no means traditional….just a twist I occasionally add). Man, do I love me some picadillo. This was the first Cuban dish my wife (who is Cuban) introduced me to when we started dating years ago. She prefers it served on white rice and topped with a fried egg. I don’t do eggs, so I take mine with beans and rice only. Sort of like empanada filling isn’t it? Mmm. My grandma (and mom, and dad…) would always start with sofrito if we had some pre-made (so add some culantro and aji peppers), and they’d always add dry sherry vinegar, achiote or bijol powder, and raisins. Anyway growing up in my house, any ground beef preparation was called “picadillo.” Regardless of whether it went into tacos or served over rice. WoW! You should open the restaurant! Your food looks amazing! The picadillo looks delicious! The lighting in your photograph is amazing! I’ve included your photo in my “Favorite Food Photo of the Week” post. The photograph is truly gorgeous! Favorite Food Photo of the Week – Food Bloggers Unite! Jacqueline – This would make a GREAT empanada filling! I love picadillo! I make it to fill pastelillos when I want a taste of home. Thanks for this recipe. I made it for dinner last weekend, with a couple of substitutions. The only olives I had on hand were the vermouth spiked ones for martinis, but I chopped them up and they added a nice flavor to the picadillo. Also, I served with brown rice. It was very yummy and I will be making this again (and again and … ) Thanks! We made this a while back and I loved it! Ate it over white rice and it was delicious! Love the combination of olives and the smokiness from the cumin. I love cuban picadillo with olives yum garlic yumm cumin Its the goods especially served by a Cuban Mom from Havanah,Cuba. Yes indeed-y I am making this for dinner tonight. Thanks for sloving the mystery on what I was going to do with my ground beef I had thawing out! This was unbelievably easy and unbelievably delicious. They made the best Taco Night I’ve had in a while, and leftovers have been added to leftover mac and cheese, scrambled with eggs, etc. to no less satisfaction. Thanks for sharing the recipe! making this tonight. this has become a favorite dish for my husband and I – neither of whom are Cuban :) so good and comforting! Pingback: Flor de Cuba’s Buffet: Cuban for the Masses « Houston Food Adventures! Another good one! I’ve been sharing your recipes on pinterest all week as this is the best looking Cuban Food blog I’ve found so far. We made the lime infused beef last week and it was amazing! Good recipes!